Standard & Poor's (S&P) downgraded 9 euro area countries, as the credit rating agency (CRA) gave to 14 countries a negative outlook, which means a further downgrade is possible. The ratings of Spain, Italy, Portugal and Cyprus were lowered by two notches. France and Austria lost their highest AAA rating. Malta, Slovakia and Slovenia were downgraded too. Germany retained its highest rating with a stable outlook. So the only AAA-rated countries in the euro area remained Germany, Luxembourg, the Netherlands and Finland. The downgrade will inevitably affect the credit rating of the bailout fund EFSF, which has so far managed to maintain the highest rating of its shares, thanks to the six AAA rated countries. S&P said it was analysing the impact of the new situation on the fund and would announce its assessment in the coming days. This is quite an unfavourable development for the fund at a time when it is trying to implement new tools approved by EU finance ministers last November. If it becomes difficult for the EFSF to raise funding, this would call into question the implementation of the additional functions, entrusted to the fund in the decisions of the 21 July 2011 Summit – to buy sovereign debt and to recapitalise banks. The rating agency motivated its assessment with the lack of convincing solutions delivered by the political leaders to tackle the debt crisis. According to S&P "the effectiveness, stability, and predictability of European policymaking and political institutions have not been as strong as we believe are called for by the severity of a broadening and deepening financial crisis in the eurozone.” CRA`s evaluation of the December 2011 European Council is also not particularly flattering, as "the agreement reached has not produced a breakthrough of sufficient size and scope to fully address the eurozone's financial problems." "In our opinion, the political agreement does not supply sufficient additional resources or operational flexibility to bolster European rescue operations, or extend enough support for those eurozone sovereigns subjected to heightened market pressures. Instead, it focuses on what we consider to be a one-sided approach by emphasising fiscal austerity without a strong and consistent program to raise the growth potential of the economies in the eurozone." S&P warns that “a reform process based on a pillar of fiscal austerity alone risks becoming self-defeating." Moreover, there is an increased risk of "reform fatigue", particularly in countries with a deep recession and bleak growth prospects. Although there are some positive elements in the so-called Fiscal Compact, agreed at the December Council, S&P believes that "the enforcement of these measures is far from certain," even if these are enshrined into national law. The main question marks the agency places are associated with forecasting deficits in a reliable and precise manner, the role of the European Commission and the possibility to reconsider the fiscal rules, if politicians decide that measures are needed to tackle the recession. The CRA`s assessment coincided with the criticism expressed by the ECB that the latest version of the Fiscal Compact "amounted to ‘a substantial watering-down’ of tough deficit levels that could allow 'easy circumvention of the [deficit] rule' by struggling governments", The Financial Times reported. "These revisions in my view clearly run against the spirit of the initial general agreement on an ambitious fiscal compact," Jörg Asmussen, an ECB executive board member, wrote in a note obtained by the Financial Times. But the main point, according to S&P, is that the proposed measures are not aimed directly at one of the main causes of the crisis, namely, "rising external imbalances and divergences in competitiveness between the EMU's core and the so-called "periphery".The CRA disagrees with European politicians that the main cause of the crisis is fiscal profligacy in the peripheral countries, citing the examples of Spain and Ireland, where in any case it is not about mismanagement of public finances before the crisis. Ireland is the only "spared" country among the peripheral economies because, according to S&P, the country is doing well in terms of fiscal consolidation and will meet its targets. "In our view, there is currently a strong political consensus behind the fiscal consolidation program and policy implementation so far has been extremely strong." Ireland has the most flexible and open economy in the periphery of the eurozone, and its "economic adjustment process is further advanced than in the other sovereigns currently experiencing market pressures." "Financial solidarity among member states appears to us to be insufficient to prevent prolonged funding uncertainties. Specifically, we believe that the current crisis management tools may not be adequate to restore lasting confidence in the creditworthiness of large eurozone members such as Italy and Spain. Nor do we think they are likely to instill sufficient confidence in these sovereigns' ability to address potential financial system stresses in their jurisdiction." S&P notes the improvement of the political atmosphere in Italy after Mario Monti`s government took power, as well as the country's ability to take effective measures, although the agency fears that they will meet resistance. The main risk to the country is its high indebtedness amid weak economic growth. Regarding Spain, S&P says there could be a further downgrade if "additional labour market and other growth-enhancing reforms are delayed or we consider them to be insufficient to reduce the high unemployment rate" (the highest in the EU); the government does not take additional measures to meet its budgetary targets for 2012 and 2013; if there is further pressure from the private sector, which could lead to the need for additional capital injections from the state. As expected, the problems of Austria stem mostly from the banking system, which could suffer from negative developments in some countries (such as Hungary and Italy) and require additional government support. In the case France's case, the decision again reflects "the impact of deepening political, financial, and monetary problems within the eurozone." S&P believes that there could be a further downgrade if Paris deviates from the planned budgetary consolidation path (a few days ago France said it would meet its deficit target for 2011), as given the current levels of deficit and the forecast weak growth, the French debt will exceed 100% of GDP. However, S&P's decision is a serious blow to the French national pride, moreover given the country's ambition to play a leading role in the eurozone, together with Germany. As a whole, the rating agency highlights continuing uncertainty for investors in primary markets as a serious risk for the eurozone countries, particularly in light of the failed negotiations for the restructuring of Greek debt. According to S&P, however, the losses of investors in the case of Greece will not remain an "exceptional situation" as politicians promise. "We do not believe that private-sector involvement will necessarily be a one-off event in the case of the Greek restructuring and would not be sought in possible future bail-out packages in a future case of sovereign insolvency or prolonged loss of market access." As to the role of the ECB, S&P believes that although the intervention of the ECB was not as strong as many investors had expected, it has provided "significant breathing space during which progress on policy reform can be made." According to the agency, "the ECB has not entirely closed the door to expanding its involvement in the sovereign bond market but remains reluctant to do so except in more dramatic circumstances." As expected, European governments and the European Commission reacted strongly critical to S&P`s actions. Last summer tensions between the EU and the US-based three major credit rating agencies - Moody's, S&P and Fitch - culminated after the agencies threatened to declare a Greek default due to debt restructuring. Subsequently, Europe announced that it was taking a course to reduce the excessive reliance on credit ratings, which reflected in several legislative initiatives. The initial market reaction to the news of the eurozone downgrades indicates that it has already been expected and calculated by market players, analysts say. 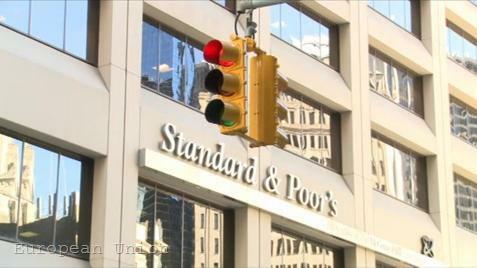 Moreover, in November 2011 Standard & Poor's lowered the French credit rating "by mistake". In August 2011 S&P did the unthinkable, taking away the highest credit rating of the US, which was also accompanied by a blunder. The American Treasury Department found a mistake worth $2 trillion in the calculations of the agency, which did not prevent, however, the US downgrade. S&P`s actions were not followed by the other two agencies, nor caused any dramatic change in the investor’s sentiment to US securities. The same thing happened to France these days - after on Friday the 13th S&P took its AAA-rating, three days later, on Monday 16th, their competitors from Moody's confirmed France's highest rating.